Wednesday: Bright and cool. Highs in the 30s. Overnight Wednesday: Snow showers develop late. Lows in the 20s. Thursday: Morning snow (rain far south), afternoon clearing. Highs near 40. A much cooler day is in place after temperatures topped off in the upper-50s on New Year’s Day across Southern New England. High pressure is in control Wednesday, which will allow the wind to subside. Even though it won’t be gusty, wind chills will be in the 20s all day long. We are on track for a mostly sunny day with seasonable highs. By Wednesday night, clouds will increase and snow showers will arrive after midnight as a disturbance moves in from the Midwest. Our temperatures will be cold enough to support all snow (at least to begin) for the exception of the South Coast and then transition to a wintry mix/rain for cities south of the Pike just in time for the morning commute. The biggest concern is for slippery travel conditions, so make sure you give yourself enough time Thursday morning. 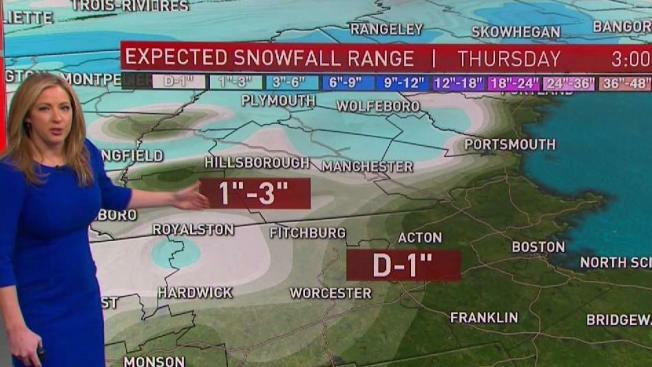 Snowfall totals will range between a coating, for areas South of the Pike, to 2 inches over the Lakes Region. The mountains in Northern New England will be big winners once again with some spots getting up to 5 inches. This system is a quick mover and come lunch hour time, most of the precipitation will be out to sea with a few leftover clouds over the region. Friday will be quiet and mild due to a southwest wind with highs in the 40s. This sets us up for another rain event come Saturday, as a storm approaches from the Mid-Atlantic. This time around, a few spots (Worcester Hills and higher terrain) could start out with freezing rain and quickly change over to rain. Then, drier air arrives Sunday with temperatures in the 40s. However, this happens early, expect the numbers to drop throughout the day. Our 10-day exclusive forecast is hinting at the chance for snow and also much colder air come the second week of 2019, but it’s too early to focus on how much at this point.